MORRIS AUSTIN TRAVELLER, EXCELLENT CONDITION. You can find us in C/ Industria 61, Barcelona. This item would make an excellent addition to your collection and a fantastic display piece. More detailed pictures below. Other Corgi. 1/43rd Scale. 1/24th Scale. 1/18th Scale. 1/32nd Scale. 1/76 'OO' Scale. Corgi CC82284 Morris Mini Cooper S. Many stars of the sixties owned and modified the iconic mini cooper with special colours and wheel designs. This again varies depending on location and size and total weight. 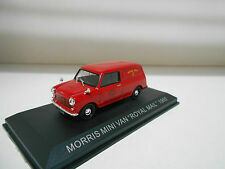 A NEW AND BOXED VANGUARDS 1:43 DIE CAST LIMITED EDITION MODEL OF A MORRIS MINI COOPER S NO. VA02509 IN YELLOW AND WHITE. Inneneinrichtung: graubeige mit eingesetztem Lenkrad, Scheibenwischer sind Teil der Karosserie, eingesetzter weißer Grill, div. Teile gesilbert, eingesetzte Stoßstangen. Beleuchtung: Scheinwerfer transparent eingesetzt, Rückleuchten rot, Blinker orange. Kyosho 08195G MINI MORRIS TRAVELLER (verde), 1/18, MIB! Item: 51 027 - Kyosho 08195G Morris Mini Traveller (Green). Notes; From a fantastic collection of, 1/18 scale, Mini's by Kyosho, Solido etc. All perfect mint/boxed, never been on display or taken out of their boxes, apart from to photograph them. NEW ITEM IN BOX. Spain, Italy, Austria, Switzerland, Portugal, Luxembourg, Slovakia and Czech Republic, £18.00 up to 20kg. CORGI 226 MORRIS MINI -MINOR. THE BOX IS IN GOOD CONDITION WITH MINOR AGE RELATED WEAR AND A INK INSCRIPTION WITH A WORN END FLAP. THE MODEL IS IN GOOD CONDITION WITH MINOR CHIPPING TO THE PAINTWORK ESPECIALLY ON THE ROOF AND BONNET ( SEE PICTURES ). PLEASE CHECK OUT MY OTHER RANGE OF DINKY AND CORGI MODELS IN MY EBAY SHOP! I'M HAPPY TO COMBINE POSTAGE! IF YOU WANT TO PURCHASE MULTIPLE ITEMS USE THE " ADD TO BASKET " OPTION AND THEN CLICK " REQUEST TOTAL FROM SELLER " BUTTON AND I WILL SEND YOU AN INVOICE THAT INCLUDES THE CORRECT POSTAGE FOR YOUR MULTIPLE PURCHASES. PLEASE ADD ME TO YOUR FAVOURITE SELLERS LIST! 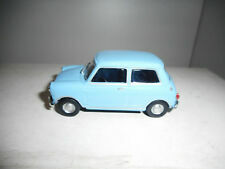 Hi here we have an early Corgi Mini it has been repainted also their is a split in the front roof pillar and as you see a hole in the front windscreen this car is great for restoration it will be sold as seen. Farbe: rot. Morris Mini. Maßstab: 1:18. This item is in mint condition as issued by the manufacturer. No Repaints or Reproductions. Weight = 952 gms. Scale = 1:18. Item Specifics. Fit for restoration purposes only. Excepting the roof and both the front and rear bulkheads every panel was either repaired or replaced. The engine was rebuilt but the car's paperwork showed the cylinder head had already been ported and polished by well respected tuners Janspeed so this was retained and fitted with unleaded valve seats. Morris Mini Cooper Racing #11 1969 James Bond 007 On Her Majesty'S Secret Service Al Servizio Segreto Di Sua Maesta' Red Yellow EDICOLA 1:43 BONDCOL071. Material: Kunststoff - Sammlermodell, kein Spielzeug, geeignet für Kinder ab 14 Jahren ! Die Top-Neuheit aus der neuen " Wiking Februar - Edition "! CORGI TOYS (227) MORRIS MINI COOPER - COMPETION MODEL. BLUE & WHITE WITH RACING NO 3. RED INTERIOR. WHITE BONNET. A SCARCE MODEL AND DISPLAYS WELL. make Supersized seem small. J'essaye de les décrire au mieux. Farbe: blau. Morris Mini Cooper S.
A lovely detailed model. This item would make an excellent addition to your collection and a fantastic display piece. RALLY CARS. Captain Scarlet. Other Corgi. 1/43rd Scale. 1/24th Scale. 1/18th Scale. MORRIS MINI /BFD68-09B0J214/ 2014. MORRIS MINI / CFL73-05B5/ 2015. MORRIS MINI /DHR86-D5B5/ 2016.